This PDF 1.5 document has been generated by Microsoft® Word 2010, and has been sent on pdf-archive.com on 10/09/2017 at 17:22, from IP address 103.84.x.x. The current document download page has been viewed 145 times. File size: 479 KB (4 pages). materials contain amorphous and graphitic forms of carbon. dye sensitized solar cells, efficiency. of platinum , , -. has been mainly used as an absorbent for purifying water . electrode materials of DSCs for the first time. external circuit with a load and the electron arrives at the CE. corrode platinum coated on the CE of the DSCs -. nitrogen at 400°C in a tube furnace. carbons of Lapsi seed-stones and Utis wood, respectively. carbons contain graphite , . (80:20) in distilled water; the CMC was used to as a binder. room temperature for ~12 hours. crystalline carbon (graphitic form of carbon), respectively. the method similar to the method described by Smestad . 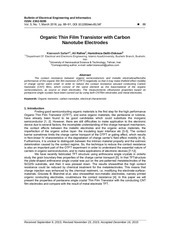 carbon are almost equally present in it , . catalyst for the reduction of tri-iodide in DSCs. chemistry, Tribhuvan University (T.U. ), Nepal and Ms.
Campus, T.U. ), and RI instruments &amp; Innovative India. electrodes for dye-sensitized solar cells,” Nanoscale, vol. 4, 2012, pp. Solar Cells, vol. 63, 2000, pp. 267-273. Society, vol. 153, 2006, pp. A2255-A2261. counter electrodes,” vol. 1, 2009, pp. 1145–1149. Communications,” vol. 12, 2010, pp. 924-927. Engineering, vol. 8, 2011, pp. 211-218. Solar Energy Materials and Solar Cells, vol. 44, 1996, pp. 99-117.
composite counter electrode,” Energy Environ. Sci., vol.2, 2010, pp. a-Applications and Materials Science, vol. 205, 2008, pp. 1895-1904.
and Photobiology C: Photochemistry Reviews, vol. 4, 2003, pp. Acta, vol. 361, 2008, pp. 572–580. This file has been shared by a user of PDF Archive. Document ID: 00671482.